READY, SET, BLEND! 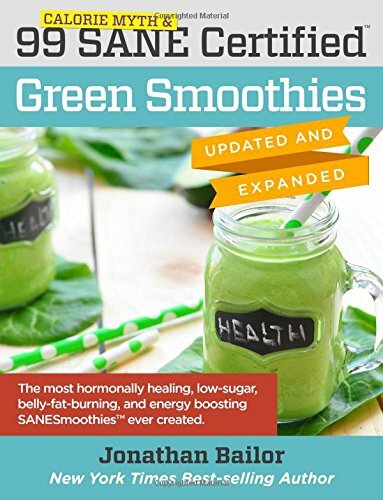 Formulated by New York Times Best-selling Author and Natural Weight-Loss Expert Jonathan Bailor, your SANE CertifiedTM green smoothies are radically different from the sugar saturated “healthy” smoothies you will find on grocery store shelves and served at smoothie chains. While those smoothies can contain as much sugar as three cans of Coke, your SANE CertifiedTM green smoothies contain about as much sugar as a cup of fresh blueberries. They also contain no artificial sweeteners, unnatural chemicals or flavorings, are 100% gluten free, never contain any GMO ingredients, and are 100% kid-approved and family friendly. In short, your SANE CertifiedTM green smoothies are the single most effective and safest beverage you and your family could ever enjoy. Backed By Research: Scientifically proven to burn fat, boost energy levels, and improve your health. Easy & The Entire Family Will Love Them: Perfectly balanced between convenience, variety, and affordability so you get great tasting results without spending hours in the kitchen. If you want to boost heath and burn fat long term, then we respectfully ask you to ignore EVERYTHING you’ve been told about weight loss. Like counting calories. Exercising every day. And avoiding fatty food. These “rules,” it turns out, are COMPLETELY in REVERSE. They’re mistakes. And that’s not hype …it’s SCIENCE. Now, based on a mountain of scientific evidence, there’s a stunningly effective science-backed plan that can help you achieve the greatest wellness success of your life. Turn your body into a fat-burning machine at any age with these revolutionary recipes! Starving yourself is absolutely pointless because your body has its own way to keep your body at a set weight, no matter how many calories you cut. It’s NOT the calories … it’s NOT the carbs … it’s NOT the fat that matters. The secret to lasting weight loss lies in the QUALITY of the food you eat. In your recipe book, you’ll discover dozens of foods that actually help lower your set-point to that of a naturally THIN person. The result? Your hormones will become balanced so you can eat to your heart’s content and still lose weight. Researchers have proved that people eating higher-quality foods lost a staggering 86.5% more body fat than typical dieters — even though they ate the same number of calories. But what ARE these higher-quality foods? Good news: They include the delicious rich smoothies you’ll discover in this book!